KOBE (JP), February 2019 — The bone marrow disease myelofibrosis is stimulated by excessive signaling from vitamin D and immune cells known as macrophages, reveals a Japanese research team. These findings could help to develop alternative treatments that do not target problem genes. The team was led by Kanako Wakahashi and Yoshio Katayama of the Kobe University Graduate School of Medicine. There are three types of blood cells: white blood cells, red blood cells and platelets. All three types are created from hematopoietic stem cells located in the bone marrow. Myelofibrosis causes an abnormal increase in the cells that produce collagen fibers called fibroblasts. The bone marrow becomes filled with these fibers, preventing the body from producing blood cells as normal. This condition can make it hard to control other diseases and bone hardening (osteosclerosis) also occurs. Myelofibrosis occurs in blood tumors called myeloproliferative neoplasms, which are caused by genetic mutations of hematopoietic stem cells. The research team focused on the relationship between blood and bone. Vitamin D is a hormone that regulates calcium, and the team had already shown that vitamin D receptors control the location of hematopoietic cells in the bone marrow. In this study, published February 4 online in Blood, the team performed a bone marrow (with vitamin D receptors) transplant for a mouse model without vitamin D receptors (this means it has a high concentration of vitamin D in the body) to create a myelofibrosis model. By analyzing this model, they found that hematopoietic stem cells were strongly stimulated by vitamin D signaling and grew into immune system cells called macrophages. These pathological macrophages stimulated young osteoblasts (cells that create bone) to induce myelofibrosis and bone hardening. The cells, known as fibroblasts, are thought to be these young osteoblasts. By giving these mice a low vitamin D diet and suppressing the macrophages, the team was able to largely prevent the onset of myelofibrosis. 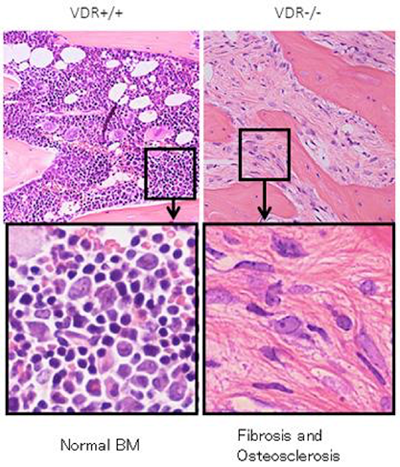 The results show that pathological macrophages produced by vitamin D receptor signaling play an important role in the development of myelofibrosis. Clinical treatment uses inhibitors to target the causative genes of myeloproliferative tumors, but this is not always effective in treating myelofibrosis. Professor Katayama commented, "The only permanent cure for this disease is hematopoietic stem cell transplant, but this method is unsuitable for many elderly patients. These new findings may help to develop a treatment method for the elderly targeting the vitamin D pathway and macrophages." Left column: The bone marrow of wild-type mice is formed of round blood cells. Right column: The bone marrow of mice with vitamin D receptors knocked out is occupied by spindle-shaped fibroblasts and collagen fibers, shows myelofibrosis. Image courtesy of Kobe University.